Greece is mostly known for its cultural heritage and beaches, but the country also offers beautiful nature for outdoor enthusiasts to explore. 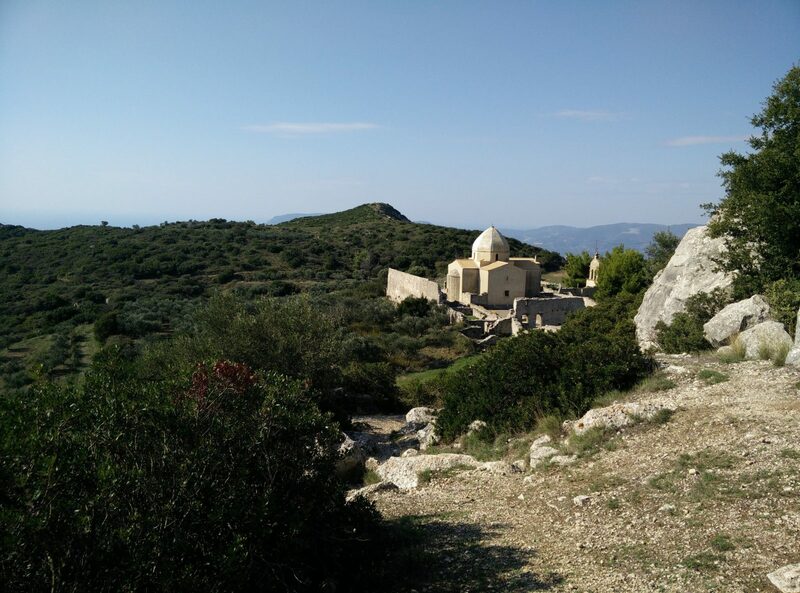 We were so fortunate to go to the Ionian island of Zakynthos (also called Zante) in the middle of October when the weather was great, but not too warm for hiking. 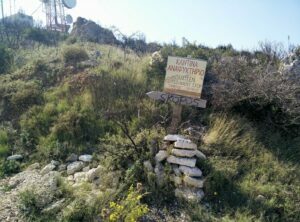 After a bit of research, we decided to hike the small mountain called Skopos close to the village of Kalamaki where we stayed. 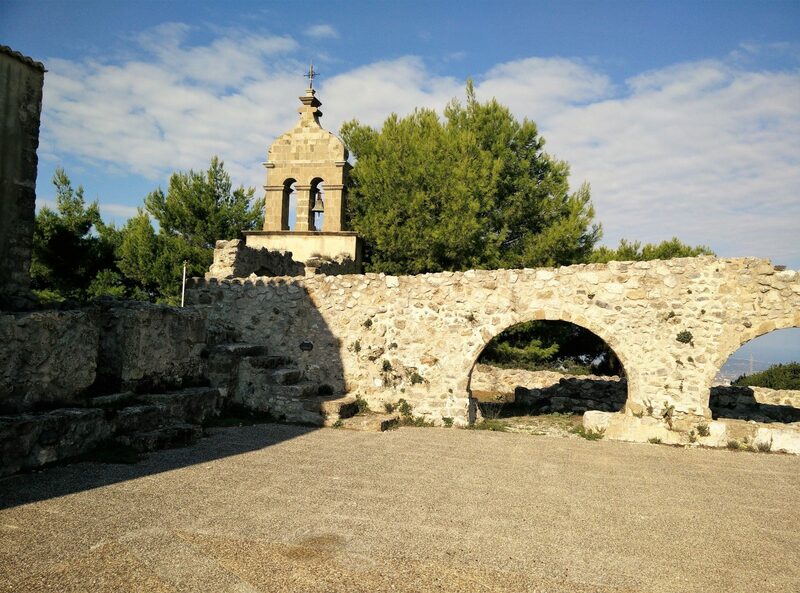 Near the top of Skopos, you will find the mostly abandoned monastery Panagia Skopiotissa (“The All Holy Mother of the God of the Watchtower”), partly in ruins, with a small beautiful church which can be opened upon request. Skopos was called Elatos in antiquity and underneath the church are the remains of a temple dedicated to the Greek hunting and nature goddess Artemis. While you cannot see the temple today, the view from the mountain makes you understand why it was always a point of divinity. The starting point is in the center of the village of Kalamaki on Zakynthos. You can reach the island either by plane to Zakynthos International Airport “Dionysios Solomos” or by ferry to the main town of the island, also called Zakynthos/Zante. Taking a taxi to Kalamaki from either is around 13 euros, but you can also go by the hourly bus from Zante town to Kalamaki for less than 2 euros (you can find schedules here). If you are coming by car from Zante town/harbor, you should head south till you reach the Temponera road which runs parallel to the canal which delineates the southern border of Zante town. You drive towards west on Temponera until you are able to turn to the right, crossing a canal bridge. 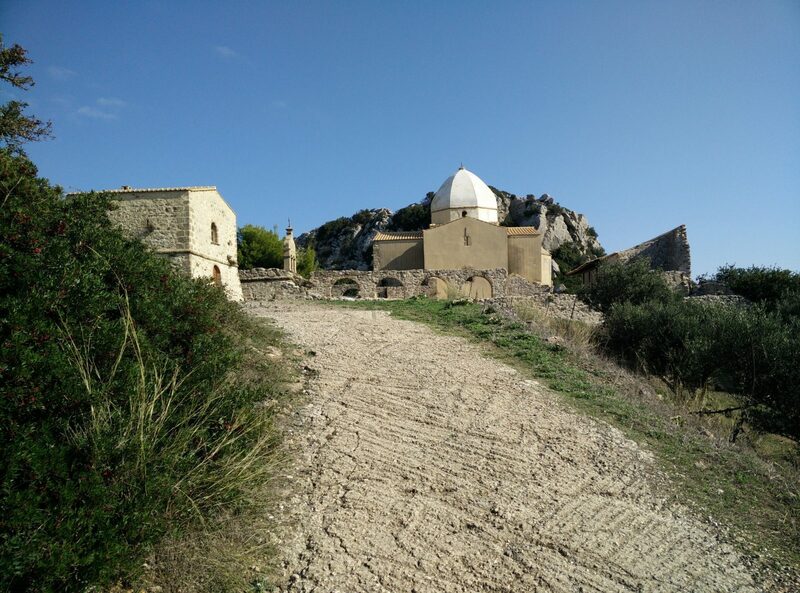 Soon after crossing the canal, the road splits into two at the Saint Gerasimosis church – you follow the directions for Kalamaki by taking the road to the right called Epar.Od. Zakinthou – Mavron Volion. 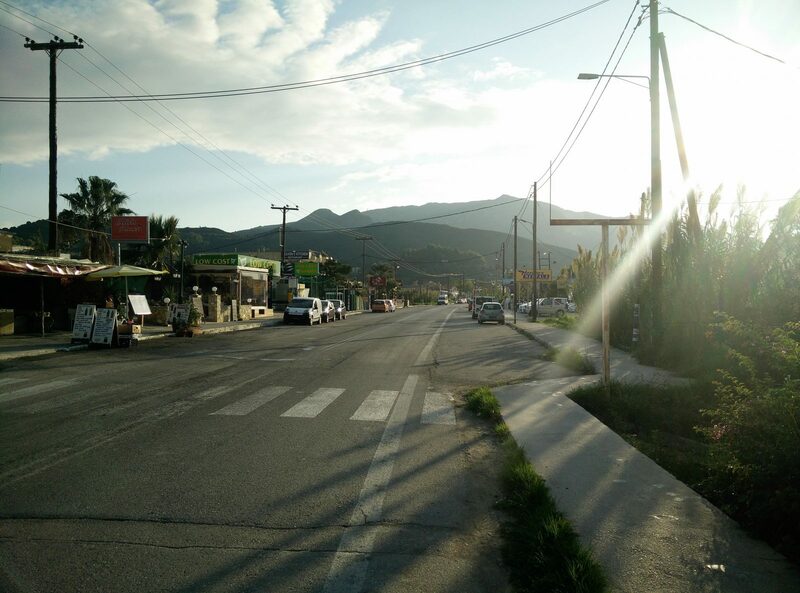 You follow this road towards for a little less than 4 kilometres – halfway you will pass by the airport. 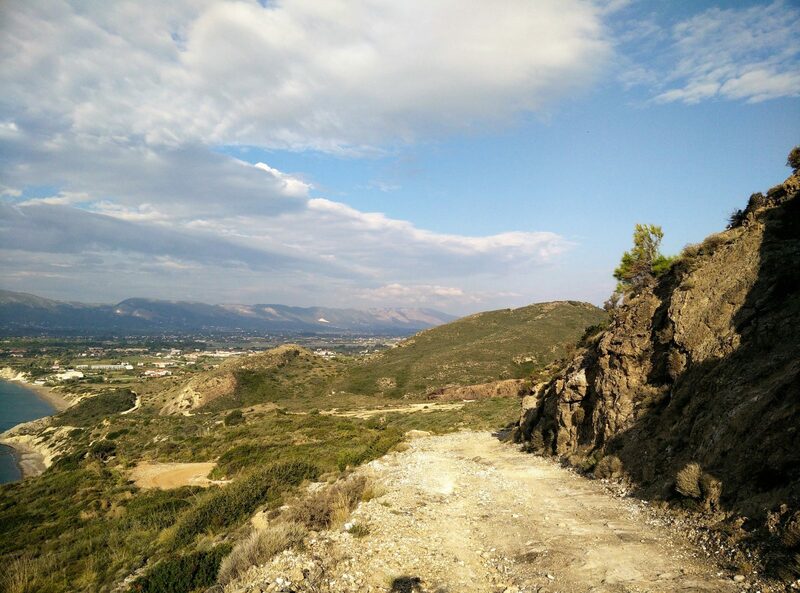 The road ends when it meets the main street of Kalamaki where the included GPS trail starts at. 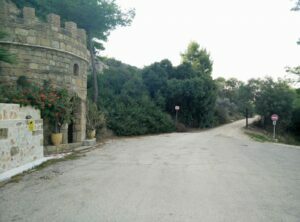 Therefore, turn to the left when you reach Kalamaki main road and drive towards east to find a place to park your car. The street has plenty of small supermarkets and even a good bakery where you can buy water and snacks for the hike ahead. 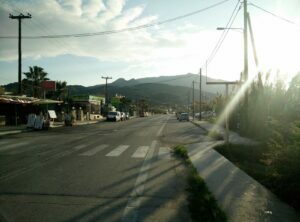 The trail starts on the main street of Kalamaki where most of its restaurants and shops are located. You follow the main street towards east until it ends; you turn right on to the road here. You, however, only walk south on it for about 80 meters till you have the option to go left. 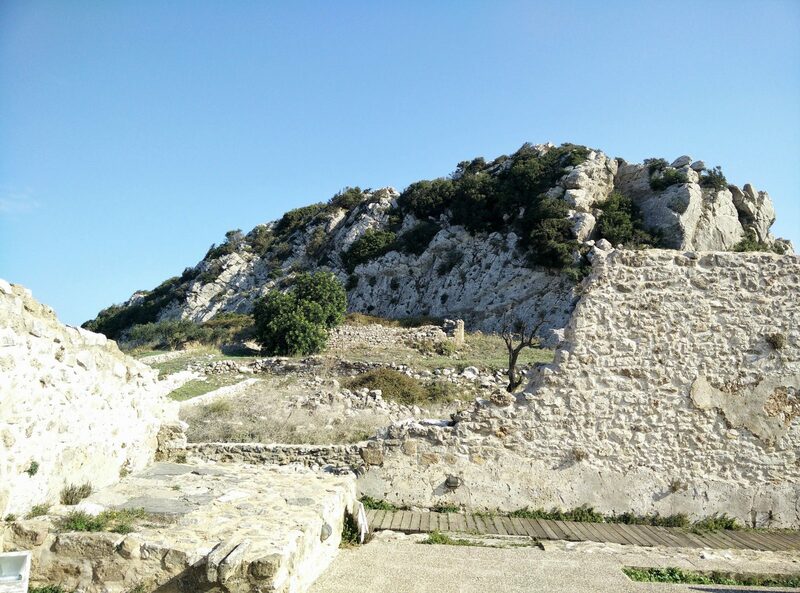 After walking for a few hundred meters you will reach the Caves bar with a very significant fake Medieval style tower; shortly after the paved road will stop and become a dirt road instead. 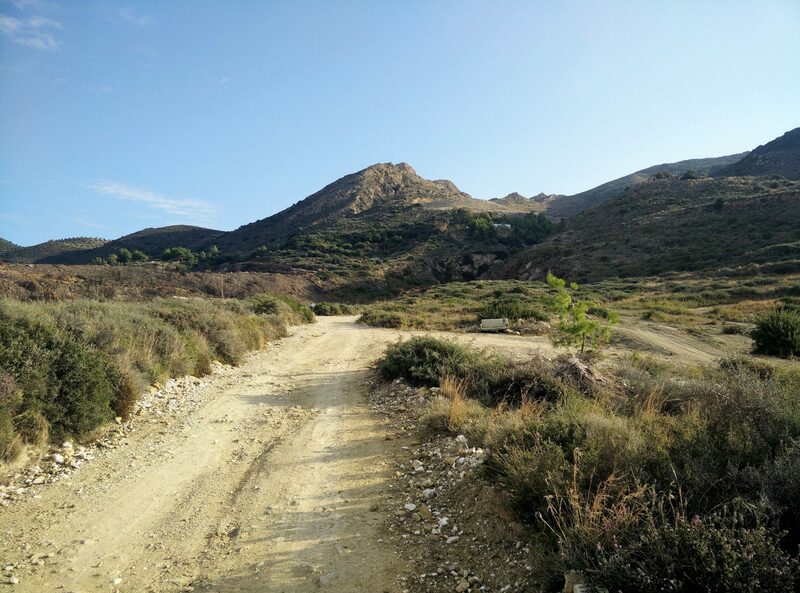 In the beginning the dirt road runs southeast between some dilapidated farm buildings with sheep, chicken and a chained dog – but don’t worry; this is the proper route to Skopos. You will see many hoof imprints in the dirt road as it is in season often being used by people exploring the mountainside on horseback rather than on foot. After walking a bit more than one kilometer altogether, the dirt road will turn towards east and you will be able to see the Mediterranean Sea, which was indeed an impressive backdrop throughout most of the hike. 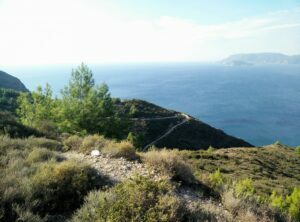 Only rarely is the view of the sea blocked by the terrain and vegetation as the dirt road meanders around the low hilltops towards the mountaintop. 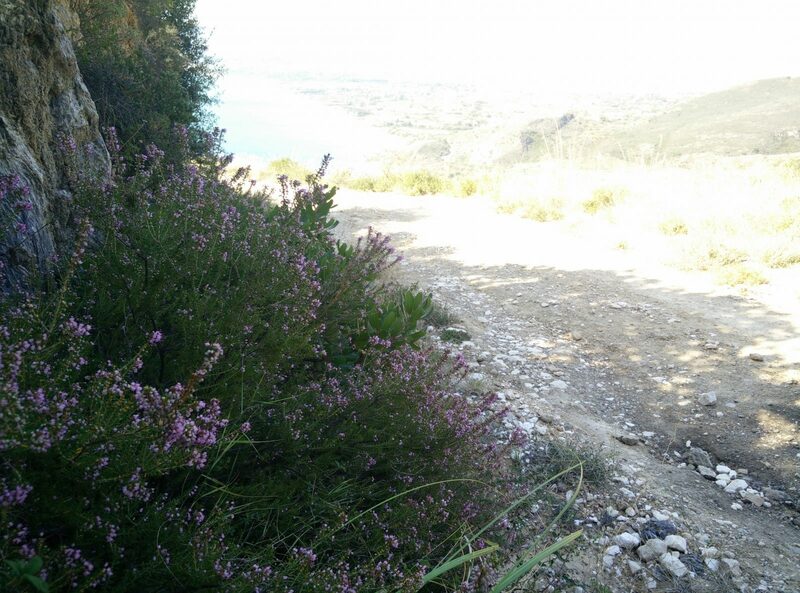 The dirt road runs very close to the sea and start turning sharply towards northeast and becoming steeper and steeper. After hiking for about a kilometer on the dirt road, it will again take you towards southeast for another 1.5 kilometer after which it turns towards northeast once again. From here the dirt road narrows into a path; it seems that most horse riders have stopped their ascent here as the traces after them cease. The path is relatively narrow for a while, with shrubby vegetation on both sides – this was the only time on the trail where my girlfriend, wearing shorts, had to a bit mindful of where she stepped. 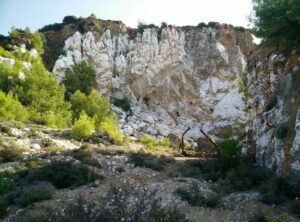 Shortly after the path runs next to a “canyon” which holds the remains of a quarry. 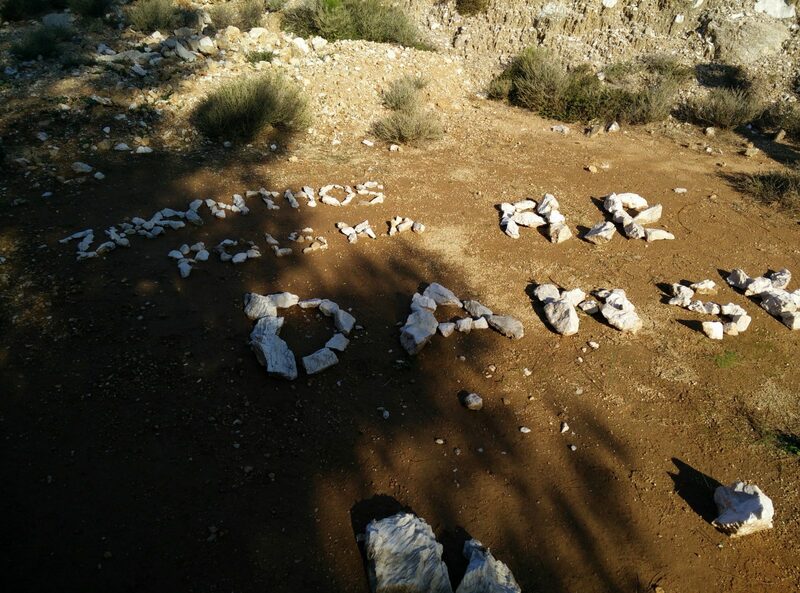 Other hikers have used stones here to spell out their country of origin, but we didn’t actually meet any other hikers until coming close to the top of Skopos. 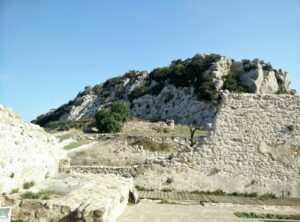 Shortly after you will also pass by an abandoned building (properly connected to the closed-down quarry), located about five kilometers away from the starting point. Here the path will run into a dirt road; you should turn left, towards north, here. After hiking for 1 kilometer on this dirt road towards north/northeast, it will take a rather sharp turn towards south at a radio tower. Here will be a sign pointing you towards the top (to the south), but at this point there should be no doubt which way you are going. A couple of hundred meters to the south you will also find the Skopos café, which is a small coffee bar with ice cream and candy; the lady who manages it is also the one who can unlock the church door to the monastery chapel. From there the dirt road meanders up through an olive grove and the serene buildings and ruins belonging to the monastery; a few hundred meters further to the northeast you will come to the top of Skopos. Or rather, you will come to the foot of a steep cliff formation which rises 10 meters or so above the ground. It is not impossible, but kind of risky to climb this formation; my girlfriend came halfway but gave up, being in shorts with no protection against the rock surface. There didn’t seem to be any safe way to the very top of Skopos and thus reaching the plateau just below the rock formation can be considered to be the top. 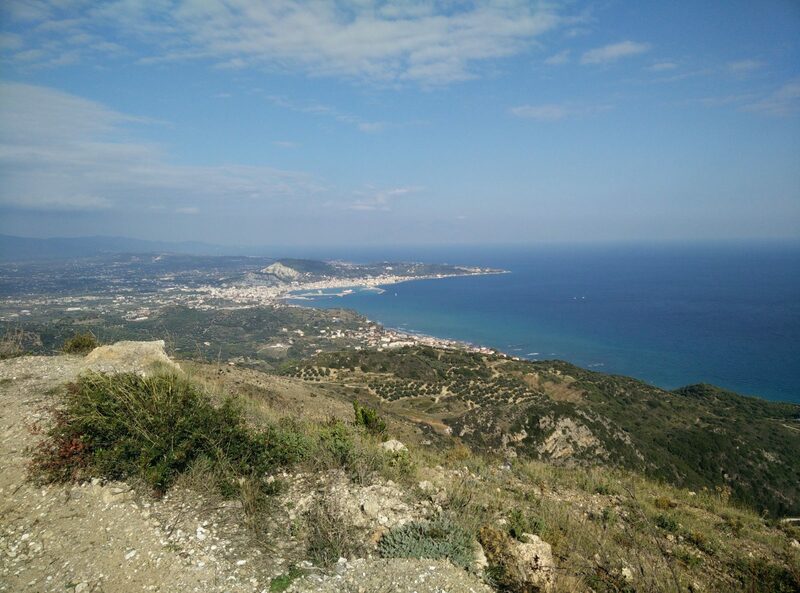 From here, you can see far and wide over the southern part of the island as well as Zante town with its ferries regularly crossing the Ionian Sea to connect the island with the mainland. From the top we made our way down to the little refreshments hut and stopped for coffee and ice cream. Afterwards we followed the same trail down as when ascending, with the difference that we made a short detour to the Vrontonero beach for a quick swim. The beach is supposedly a nudist beach but we only met another dressed couple. After the swim we went back up on the track, but we were debating if we should just continue along the shore to reach Kalamaki beach and town by walking barefoot and -legged in the low tide. We decided against it due to the seemingly stony seabed there, but in case the tide becomes low enough it would make for a lovely alternative route back to the starting point. Because the hike was short, I didn’t bring too many things with me. In my backpack I was carrying water, some food and sun cream. While hiking I was wearing the Icebreaker Tech t-shirt, Montane Terra Pack pants, Lowa Innox Lo GTX hiking shoes and a sun hat. I should have taken a fleece jacket on this hike because the temperatures were lower than I expected. I was slightly cold for the first part of the hike. 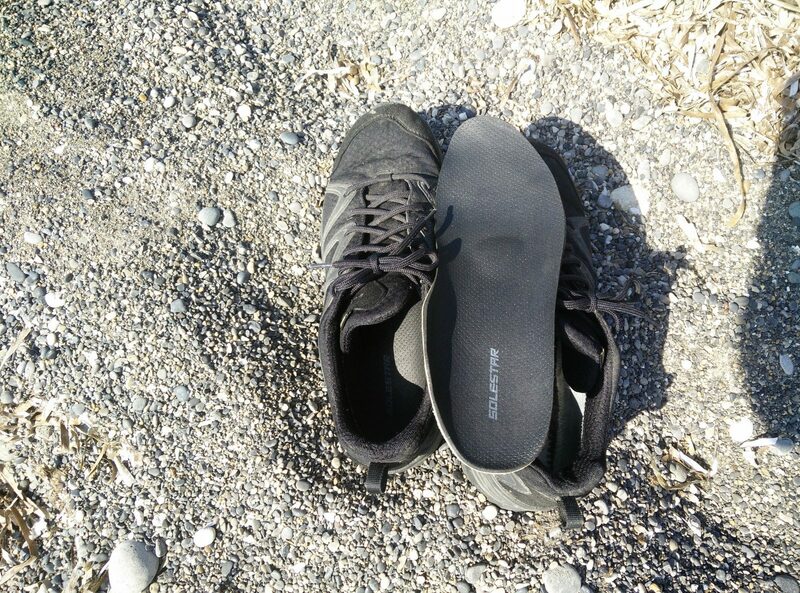 I was very satisfied with Solestar hiking insoles which I tested on this hike. They are very comfortable and provide great stability. 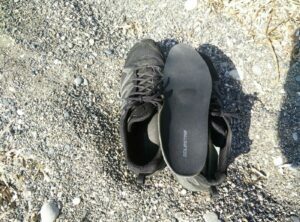 On rocky terrain you immediately notice the difference because the shoe/boot feels much more stable. 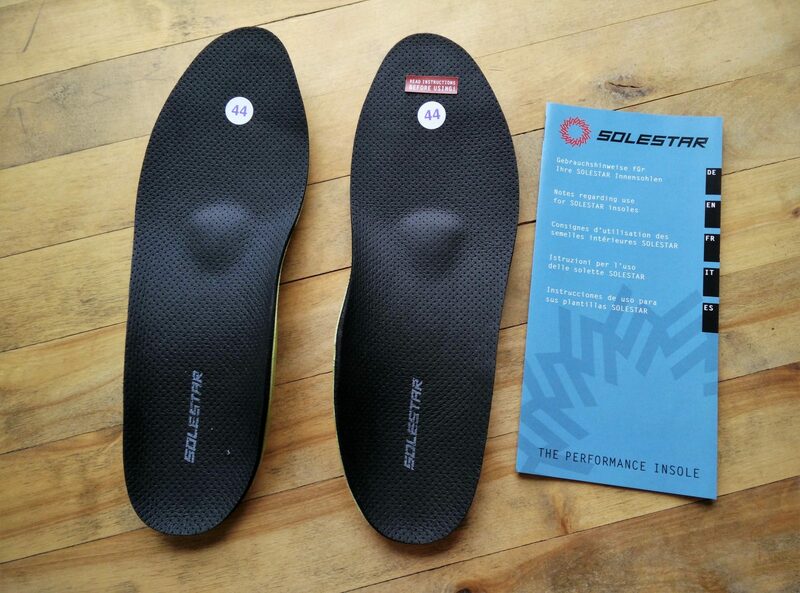 However, they are slightly less moisture-wicking than the original Lowa insoles. Nevertheless, I keep wearing them because the pros outweigh the cons. Read the review of Solestar hiking insoles as well. The Skopos trail is a great trail which is suitable for all, and can be done without any special equipment. 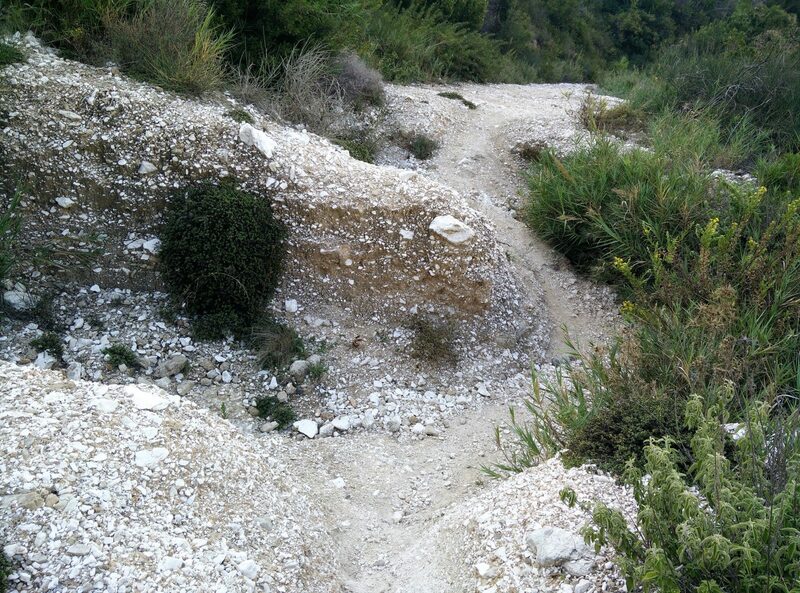 If the temperature allows it, you can even wear shorts as the trail is relatively clear from abrasive vegetation etc. 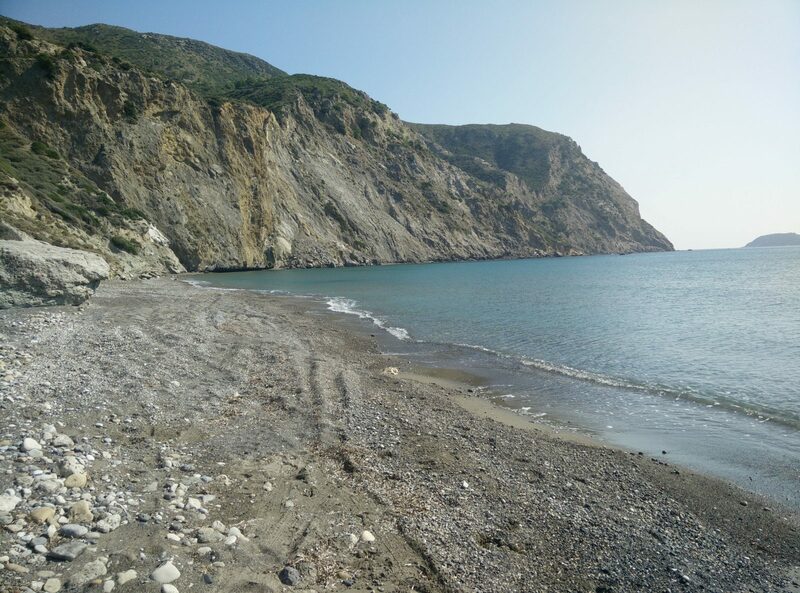 Be sure to bring plenty of water and sunscreen; you can spoil yourself with a coffee or ice cream close to the top, and don’t miss the opportunity to go swimming at the Vrontonero beach. The trail itself allows you to admire the view of Zakynthos’ southern shoreline, the zoomorphic Turtle Island, the low but beautiful mountains towards west and of course the gleaming Mediterranean Sea.